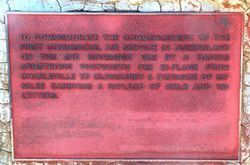 The plaque and storyboard commemorate the first regular Queensland air service from Charleville to Cloncurry. 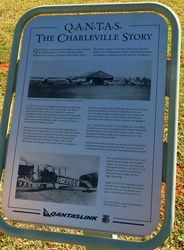 On 2nd November 1922, the first regular Queensland air service commenced from Charleville to Cloncurry. The Qantas Armstrong Whitworth FK8 Biplane left carrying a load of 400lb payload and 160 letters. The staff of 3 included engineer Arthur Baird and pilots P.J. McGuiness and W. Hudson Fysh. The first passenger was Mr Alexander Kennedy (85 years old) who had pioneered the Charleville to Cloncurry route 53 years earlier with a team of bullocks. To commemorate the commencement of the first commercial air service in Queensland on the 2nd November 1922 by a QANTAS Armstrong Whitworth PK8 Bi-plane from Charleville to Cloncurry a distance of 557 miles carrying a payload of 4000 lb and 160 letters.